I didn't get much of a chance to do a lot of updates today, strictly bonus offers! 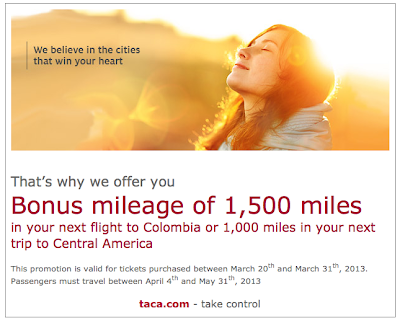 If you are planning any travel to Central America or Colombia after Easter check out the LifeMiles bonus for TACA flights out of Toronto. There is a short booking window to earn the bonus so make up your mind by the end of the month if you want to take advantage of it!